Cockatoo Island convict prison Bell, also used at Walsh Island. 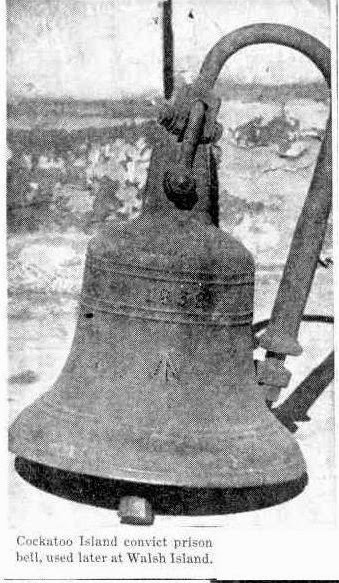 Inquiries made by the Newcastle and Hunter District Historical Society through 'The Newcastle Sun,' regarding the history of an old bell, dated 1838. formerly used at Walsh Island and now at the Public Works Department offices, have met with success. The President of the Society (Aid.W. J. Goold) said to-day that he had been informed by Mr. J. Sharpe, of Stockton, that the bell had been at Cockatoo Island when it was a convict prison. When the Government dockyard was started at Walsh Island, said Ald. Goold, a good deal of material from Cockatoo was sent to Newcastle, and It was believed that the bell was among it. The bell, slightly larger than a ships bell, was used at Walsh Island to guide ferries to their berth on foggy days. The Historical Society has secured permission to use the bell In the exhibition to be held during the 150th Anniversary celebrations, and it Is hoped It will be given to the society, which will find a permanent home for it. Mr. J. Hutchinson, of Pokolbin road, Broadmeadow, has given the society an old bell which was used on the winding engine of the old Bore hole colliery at Hamilton. It la hoped to secure a collection of bells of historical interest for the exhibition in February.